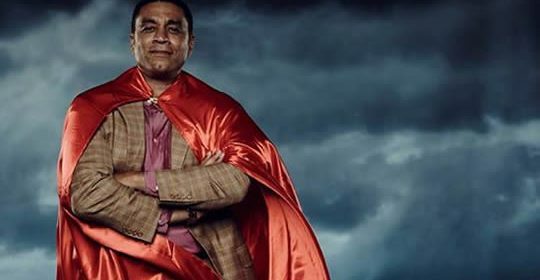 Northlight Theatre will honor actor Harry Lennix with the 2017 Speak Up! Award at the Theatre’s premier fundraising event, “Staging the Future Together,” on Saturday, November 4, 2017, at6:00pm, at The Evanston Golf Club, 4401 Dempster, Skokie, IL. The Speak Up! Award recognizes individuals who “speak up” about important issues impacting our society. Recipients must also have a connection to Northlight Theatre and should exemplify leadership, advocacy, and a deep commitment to community. Artistic Director BJ Jones comments, “Harry Lennix has been an articulate, passionate advocate for social change and inspiration for the thirty years that I have known him. We are proud to recognize his voice and his efforts as a member of the Northlight Family. Harry Lennix is a renowned film, television and stage actor from Chicago’s Southside. He attended Quigley Seminary high school, and began his professional acting career while a scholarship student at Northwestern University. He maintained his professional career while teaching fulltime in the Chicago Public Schools. His prolific career includes films: Man of Steel, Ray (for which he earned a SAG Award nomination), The Matrix sequels, Barbershop 2, Love and Basketball, The Human Stain and State of Play; and television: NBC’sThe Blacklist, ABC’s Commander in Chief, the FOX hit series 24, as well as ER, Diagnosis Murder and Dollhouse. Harry has appeared in stage productions across the country, including Northlight Theatre’sPermanent Collection in 2005. In 2001 he was part of the first American company to be invited to the Royal Shakespeare Company, and he made his Broadway debut in 2007 as the central figure in August Wilson’sRadio Golf, which was nominated for a Tony Award. In addition to his accomplishments as an actor, Harry works to promote social change as evidenced by his founding of Exponent Media Group (EMG), a film production company dedicated to high quality films about the African American experience. Projects include H4, a reimagination of Shakespeare’s Henry IV translated into 21st century urban Los Angeles;Troubled Waters, chronicling the journey of a stand-up comedian inspired by Richard Pryor; and the gospel concert movie Revival. He has generously lent his time and voice to the National Association of Drug Court Professionals PSA campaign and met with many Congressional leaders to advocate for Drug Courts, for which he was the recipient of a 2011 NADCP Ambassador Award. He is a frequent speaker at colleges and universities on the importance of activism and advocacy as an African American actor. A long-standing member of Northlight Theatre’s Advisory Council, Harry also holds board or advisory positions with The Goodman Theatre, Northwestern University, Congo Square Theater, and The Robey Theater (LA). The Speak Up! Award is rooted in Northlight Theatre’s Speak Up! theatre for social change program—an initiative for middle school and high school students in 12 schools throughout the Chicago area. Northlight’s fastest growing arts education program, Speak Up! brings a custom-designed residency program to increase students’ participation in the arts by making theatre accessible while building creativity, reflection, confidence, and collaboration skills. Topics that have been addressed by past Speak Up! residencies include bullying, gang violence, police brutality, role models, and stereotyping. The first recipient of the Speak Up! award was H. Woods Bowman who lived his life “speaking up” for people and causes he believed in both as a member of the House of Representatives and as an educator at DePaul University. Woods received the honor posthumously in 2016. Northlight Theatre’s 2017 Gala: Staging the Future Together, will be held on Saturday, November 4, 2017, at 6:00pm, at The Evanston Golf Club, 4401 Dempster, Skokie, IL. The evening will be a celebration of Northlight’s extensive history of producing new work. New work that premieres on Northlight’s stage often continues to enjoy multiple productions around the country thus fueling the American theatre canon. Chicago-based entertainer and producer Michael Ingersoll will serve as Master of Ceremonies for the evening. The festive event will include a cocktail hour, a seated dinner, a paddle raise, and live and silent auctions filled with unique and priceless activities and excursions. The evening will be capped off with musical entertainment performed by Ingersoll. Gala chairs are Julie Chernoff and Susie McMonagle of Evanston. Host committee members include Candace Corr and BJ Jones, Nancy Cunniff and Alan Zunamon, Jane and Timothy Evans, Donna and Gene Frett, Catherine Hayden and Tom Carmichael, Neal Moglin and Mark Tendam, Karen Hunt, Josh Chernoff, and Dan Reinberg,all of Evanston. Proceeds from the event will benefit Northlight Theatre’s mainstage productions, imaginative and inclusive arts education programs, and the Interplay Program for New Plays. Tickets are $250; Tables of 10 are priced at $2,500. Corporate sponsorships are also available at varying levels. To purchase tickets and/or inquire about sponsorships, contact Northlight Theatre at 847.324.1614. Now in its 43rd season, the organization has mounted more than 200 productions, including nearly 40 world premieres. Northlight has earned 202 Joseph Jefferson Award nominations and 34 Awards. As one of the area’s premier theatre companies, Northlight is a regional magnet for critical and professional acclaim, as well as talent of the highest quality. Northlight is supported in part by generous contributions from leading sponsors: Allstate, the Paul M. Angell Family Foundation; BMO Harris Bank; Henrietta Lange Burk Fund; The Elizabeth F. Cheney Foundation; The Chicago Community Trust; ComEd, An Exelon Company; The Davee Foundation; Edgerton Foundation for New American Plays Award; Illinois Arts Council, a state agency; Kirkland & Ellis Foundation; The John D. and Catherine T. MacArthur Foundation; Northern Trust Charitable Trust; The Offield Family Foundation; The Pauls Foundation; The Shubert Foundation, Inc.; The Sullivan Family Foundation; Tom Stringer Design Partners; and the National Endowment for the Arts.